Nashville, nicknamed the Athens of the South, is a hotbed of culture, technology, and music. The city’s population is expected to reach nearly two million residents by the year 2020. Two million foodies, two million music lovers, two million sports fans, so why not two million board game lovers? Board game cafes are popping up all over the world. Spurred on by a movement away from digital interactions, and a more than billion dollar a year board game industry, more and more people are taking their interactions to the gaming table. Inspired by Toronto’s Snakes & Lattes, considered to be the grandfather of board game cafes, Meeple Mountain plans to bring the lost art of the face to face interaction to Music City. What’s a Board Game Cafe? A board game cafe? In Nashville? Yes! Board game cafes have a wide and varied audience. Very few activities evoke such nostalgia like that of gathering around a table and playing games with friends and family. Some people come in to hang with friends, some come to play the newest and best games, while some might just sneak in to grab a locally roasted coffee and a pastry. Lest you think that board game cafes just have a few dusty copies of Scrabble or Monopoly, think again. 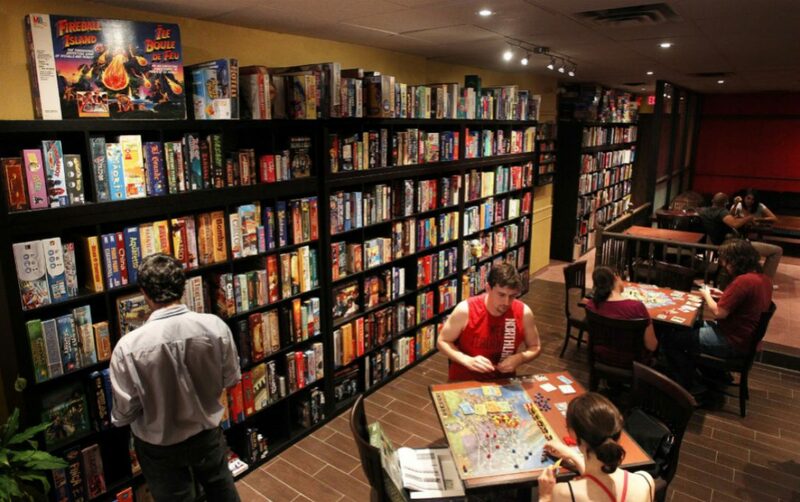 Many board game cafes have hundreds upon hundreds of games in their libraries; all of them available for patrons to play while sipping coffee or beer, and munching on snacks or sandwiches. Why a Nashville Board Game Cafe? Nashville has nothing like this, in fact we don’t know of another board game cafe within 200 miles of Nashville. We’ve been keeping this one under wraps for a while but we made the big reveal at our recent Nashville Tabletop Day and announced the news to a cheering crowd of nearly 300 people. Meeple Mountain Board Game Cafe will include cafe and retail space, room for private event bookings, frequent public events, and more. We’re targeting a Fall 2017 or an early 2018 opening. The Meeple Mountain board game cafe will be co-owned by partners Elijah Longwell, Adam Murray, Jared Snyder, and Andy Matthews. Inquiries can be made to info@meeplemountain.com. Visit http://www.meeplemountaincafe.com/ to be notified of our plans as we release them.